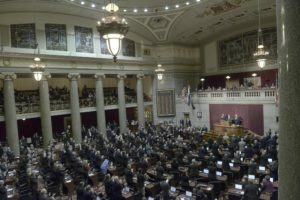 A proposal to eliminate a tax credit for low-income seniors and disabled renters in Missouri is expected to move to the House floor soon. In spite of protests from advocacy and care groups, the bill would do away with the tax credit referred to as the “circuit-breaker” and establish a “senior services protection fund” to help shore up Gov. Eric Greitens’ proposed $52 million cut to home-and community-based health services. Budget Chair Scott Fitzpatrick (R- Shell Knob) estimates that the legislation could save about $55-60 million a year. Several Republicans say renters don’t pay property taxes, and the money paid out to them should instead be used to cover healthcare costs. They say seniors would value continued health care services over a small yearly payment. The change could affect around 100,000 people who currently receive a once-a-year payment of around $500 to $750 in the form of a tax refund. Many seniors use it to afford items not covered by Medicare like pajamas and incontinence supplies. Advocates for seniors call the proposal robbing Peter to pay Paul. They say it could remove an important part of the net that has protected the vulnerable in Missouri since 1973. The circuit-breaker also helps people with disabilities living on fixed incomes afford things that improve their quality of life, says Kim Lackey with St. Louis-based Paraquad, an organization that provides services to more than 3,000 people with disabilities. Testifying before the House Rules Committee on Monday, Lackey said many of Paraquad’s clients are low income, rely on Medicaid, and get by on no more than $842 a month. For many of them, the circuit-breaker means affording helpful technologies that might normally be out of reach. Lackey told the rules committee what one client with dyslexia and trouble breathing had planned to do with this year’s payment. Lackey said the yearly payment helps many of Paraquad’s clients remain independent. She said clients are worried about their extra yearly income disappearing. Craig Mershon receives services from Paraquad. Though he suffers from mobility issues, he told the committee he is largely independent, and holds a college degree. He uses the $500 he receives each year from the circuit-breaker to keep things that way. Mershon had to borrow a scooter from his neighbor to attend Monday’s hearing because his requires an expensive repair. Transportation for people with disabilities can be tough on short notice. Disability advocate Wayne Lee, who suffers from epilepsy, told the committee he had to arrange his transportation the night before through a mobility service provided by Jefferson City. Last week, advocacy groups criticized the House Budget Committee for moving the proposal forward on such short notice, saying that people with disabilities and low income would have trouble coming to testify against a tax credit cut. The committee introduced the legislation with little fanfare two weeks ago, with little information about it online. In a tweet last Tuesday, Cathy Brown from Paraquad suggested it was a deliberate move on the part of House Republicans. The measure is a revival of a 2013 effort, first supported, then vetoed, by former Governor Jay Nixon (D).